Fragrance – fragrances add flavor or scent to lip balms. Be aware fragrances can be derived from plants or botanicals (natural) or through chemical processes (synthetic). The most common fragrances include geraniol, cinnamaldehyde, hydroxycitronellal, isoeugenol, eugenol and oak moss. Essential oils – essential oils such as peppermint (think menthol) and spearmint are commonly found in lip balms. They add flavor and a pleasant scent. However, just like fragrance, essential oils can also be the culprit for an allergic reaction. For those with sensitive skin, these oils can cause irritation in the very least. Eugenol – is a compound derived from the essential oils of clove and cinnamon. The scent is spicy and can be listed as eugenol alone or mixed in with fragrance. Be on the lookout for other names it is also known as (such as 2‐Methoxy‐4‐Allylphenol, eugenic acid). Butylated hydroxytoluene (BHT) – functions as an antioxidant and is added to help preserve the shelf life of the product. Environmental Working Group’s Skin Deep database notes BHT as a known skin allergen. Camphor – is a waxy substance that is derived from the Camphor Laurel tree. We came across this ingredient in a lip balm which is primarily used in treating cold sores as well as dry chapped lips. Contact dermatitis has occurred in patients where camphor exposure came from eardrops and sunscreen use. Propolis – a natural resin collected by bees from certain cone bearing trees and poplars such as cottonwood and aspens. The resin gets incorporated into the beehive so be sure to avoid beeswax if you’re sensitive to propolis. Balsam of peru often cross reacts with propolis so avoid both altogether! Beeswax (INCI: Cera Alba) – see above for propolis. If you’re sensitive to bees and bee products, avoid beeswax as an ingredient. Lanolin – is a wax derived from the wool fleece of sheep. The lanolin acts as a lubricant as well as a waterproofing agent preventing the wool from getting wet. Lanolin is added to cosmetics including creams, lotions, shampoos, lipsticks and lip balms for the same purposes of softening and moisturizing the skin. Other terms for lanolin include wool alcohols, wool fat or wool grease, wool wax or anhydrous lanolin. Parabens – are chemicals used as preservatives in skin care products, cosmetics, food and even over the counter medications. Most commonly found in our cosmetics are butylparaben, ethylparaben, methylparaben and propylparaben (these are just some of the names it follows under). These preservatives are among the most common allergens found in lip moisturizers. Chemical sunscreen agents – lip balms can offer sun protection for our lips by including sunscreen ingredients. Chemical sunscreens such as octinoxate and oxybenzone help absorb harmful UV rays but may be problematic if you’re allergic to them. As an alternative, try patch testing yourself to a lip balm that uses physical blockers such as zinc or titanium dioxide to see if they are okay for you to use. 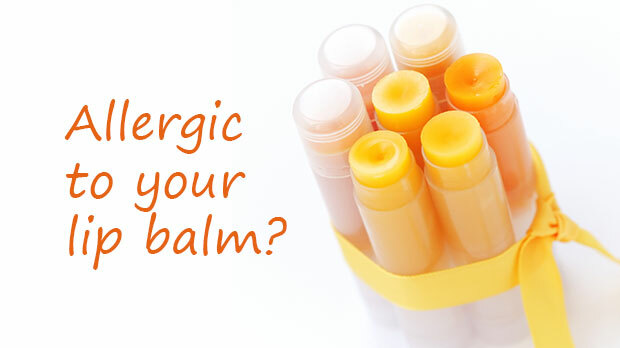 What to do if you find yourself allergic to your lip balm? If you experience any symptoms of redness, itching, burning, lips peeling, puffiness or rash either on the lips or around the mouth after lip balm use, you could be allergic to it. Tip # 1: Stop using the product. If symptoms are more than minor itching and burning, you should contact your dermatologist or primary care physician for advice. Tip # 2: Remove any residual product on the skin by gently cleansing skin with soap and water and patting the skin dry. Tip # 3: Apply cold water compresses using a small washcloth for 5-10 minutes. This can help in soothing the skin and calming down any inflammation. Tip # 4: if the lips feel dry, apply a neutral product like petroleum jelly (Vaseline) or even olive oil. Stay away from anything with fragrances, essential oils or salicylic acid as they can cause further irritation to the skin. Tip #5: if symptoms worsen, contact your dermatologist or primary care physician. Tip #6: ask your dermatologist about patch testing if you want to find out what allergies you might have to ingredients used in cosmetic products. If you're looking for natural alternatives to chemical filled balms, find some here. Have you ever had a reaction after using a lip balm... What lip balm did you use? Do you have any helpful tips to share with others?